From reading news on tablets to video calling on smartphones, digital media has changed the ways in which we communicate. 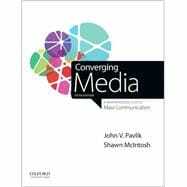 Placing convergence at the center of the discussion, Converging Media: A New Introduction to Mass Communication, Fifth Edition, uses the technologies we employ every day to explain our current media environment-and to consider where we might be headed. Convergence Culture: User-Generated Content: Creativity Or Piracy? What Makes Mediated Communication Different? Convergence Culture: Freesheets: Riding the Rails of Newspapers' Future? Convergence Culture: 3-D Movies: What Will Be The Impact? Convergence Culture: Is Playing Video Games Bad for You? What Is "Social" about Social Media? Are Social Media Making Us Less Social? Are Social Media Making Us Dumber? Media Matters: How Connected Are You? Convergence Culture: Are We Really Separated by Six Degrees? Convergence Culture: Platypus Journalism: The Future, or Evolutionary Dead End? Media Matters: How Moral Are You? Ethics In Media: Does the Punishment Fit the Crime? Media Research: What Type of Science Is it? Convergence Culture: How Free Is Academic Freedom? Ethics In Media: Can Imagery Lead to Action?